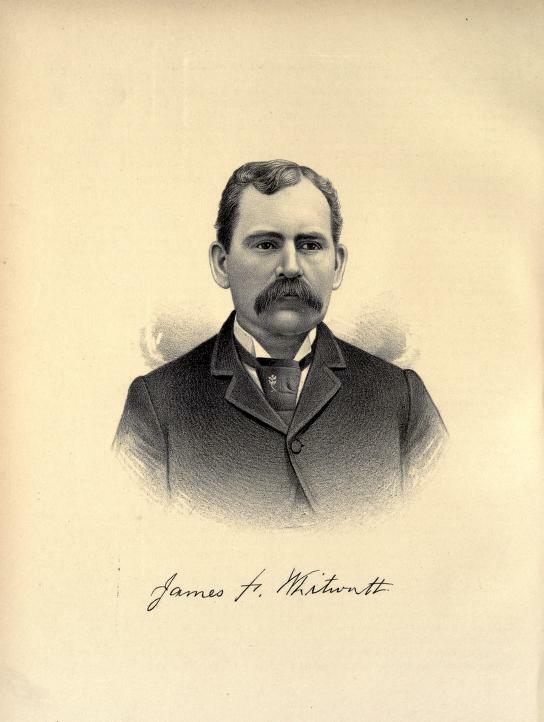 JAMES F. WHITWORTH. The head of the very extensive mercantile house of J. F. Whitworth & Company at Sorento, and one of the prominent merchants in that place, was born at Mulberry Grove, Bond County, this State, December 18, 1856. He was the sixth in order of" birth of a family of nine children that were at the same time the comfort and care of their fond parents, Marcus L. and Jane (White) Whitworth. Marcus L. Whitworth was born near Nashville, Tenn., December 12, 1822, and was the second of a family of ten children, four 003-8 and six girls. The ancestry of the Whitworth family can easily be traced back in the history of the country for more than two centuries. Great-grandfather Whitworth emigrated with a brother from Lancaster, England, the place of their nativity, and first settled in Maryland, but soon moved to Tennessee and located land not far from Nashville. There John Whitworth, the father of Marcus L., was born, grew to manhood, and was an extensive land and slave owner. The old homestead where John Whitworth first settled, and where John, Jr., was born and died, is still in the Whitworth family. Our subject belongs to a family the members of which form a brilliant galaxy of social and financial lights. The surviving members who still reside in the South are men of large wealth and prominence. The father of our subject was reared on the home plantation, and there received a liberal education. For many years he was a slaveholder, but whether from dislike of the institution of slavery or not, we cannot tell, he left his native State and came to Illinois in 1846. Marcus L. spent some time in White County, where he became acquainted with Jane White, the sixteen-year-old daughter of William and Nancy White, prominent and wealthy farmers of that county. The following year they were married, the groom taking his young bride to Nashville, where they resided until 1854, when they returned to White County. The following year they located near Mulberry Grove, where they purchased and improved a farm, and where the father died in February of 1880. Briefly we have given an outline of the antecedents of the man whose history is the basis of this sketch. 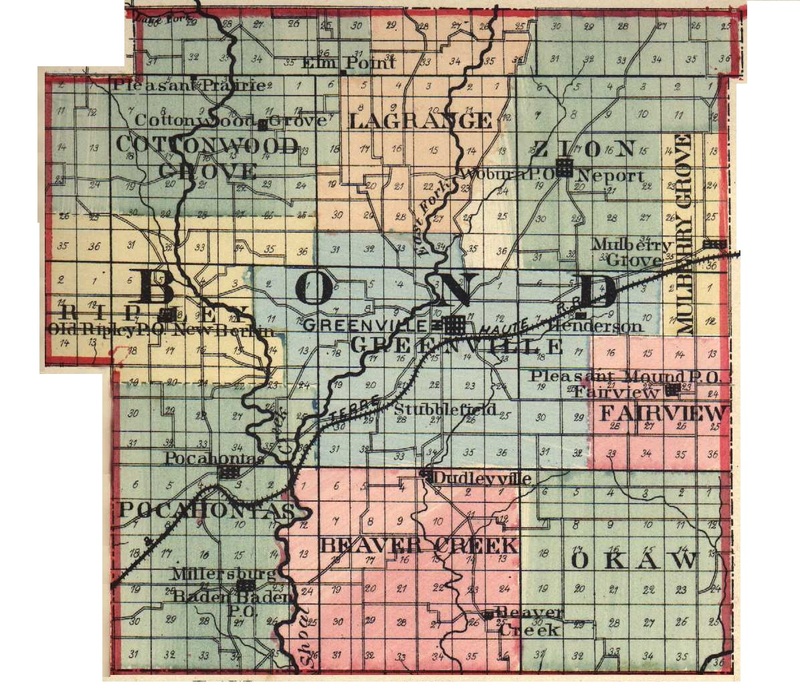 That of his brothers and sisters is very briefly as follows; Sarah is the widow of Henry Parrott, who died in 1889; Martha is the wife of Edward Moss, a farmer in Arkansas; Marcus L., Jr., is a farmer in Bond County; Mary is the wife of William N. Anthony, also a farmer in Bond County; Florence is the wife of Walter W. Mitchell, the junior member of the firm of which our subject is the head. The original of our sketch grew to maturity on the home farm and received a fair education. He must have made rapid strides in his boyhood days, for at the age of fifteen years we find him teaching school, and at the age of eighteen a student at the Shurtleff College of Upper Alton. After completing his education he went to Kansas and was successfully engaged in stock business for two years. He then returned to Illinois and was for two years engaged in farming, and afterward he established himself in the mercantile business in Sorento, where he has built up one of the largest mercantile houses in Bond County. Success has seemed to force itself upon our subject, for while he is a business man of more than ordinary ability, his advancement has been most marked among other positions of trust that he has held. He is now the Mayor of the town, and is ever active in the upbuilding of the place. Mr. Whitworth was married in August of 1887 to Miss Annie (Saathoff), daughter of Henry Saathoff, a wealthy German-American who now lives near Sorento. They have two children: Delia, a bright girl of four summers, and George J., who is two years of age. Extracted 20 Dec 2016 by Norma Hass from 1892 Portrait and Biographical Record of Montgomery and Bond Counties, Illinois, pages 324-325.